OMG India, DND SMS Service Provider Company in Delhi uses Internet to deliver DND SMS Services with Sender ID. OMG India, forward-looking Open Route Bulk SMS service provider Company in Delhi India, offers effective Open Route Bulk SMS services at reliable & affordable rates. It is the part of promotional sms campaign that customers use to send the promotional updates and information to their target audience. OMG India has a wide range of SMS solutions and product structures industrialised to meet all of your SMS messaging requirements. Open Route SMS are the fastest services in telecom industry to make maximum return on investment in less time at the most equitable amounts with the wildest messaging service at OMG India. Open Route SMS Marketing Survey: As per Latest Open Route SMS Marketing in Delhi India Survey, Open Route SMS has become the Inexpensive and Communicating media for Marketing, Advertisement, Promotion, Branding Business Growth, startups success and Reach to Millions of Customers‎ in one shot as compare to other media like News Paper, Radio FM, TV, News Channel and Outdoor Media. Open Route SMS Gateway Service Provider: OMG India is forward- thinking and one stop Open Route SMS Gateway Service Provider in Delhi India. We offer the Best In Class Delivery Interface to clients which includes options like Share Images, Web URLs, Full-Featured APIs, Real-Time Reports, Quick, Easy to use, Easy Setup, 24X7 Customer Support, Sender id, No Time Limit and many more. We offer Features that make us smarter. 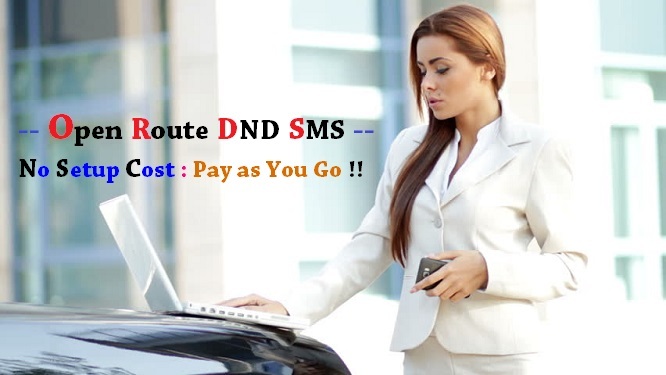 #1 Open Route DND SMS - No Setup Cost, Pay as You Go‎ !